by Smith, Adam, Haggarty, John, Rogge, Benjamin A.
Smith, Adam, Haggarty, John, Rogge, Benjamin A.
Adam Smith was an eloquent man of considerable philosophical and historical learning. His most incisive and enduring observations are collected here on subjects ranging from political and economic history to morals, art, education, war, and the American colonies. Throughout, notes an admirer in the introduction, "his writing is blessedly free of that use of jargon (and mathematics) that characterizes most of the modern materials in economics. His ideas are expressed in a lucid, straightforward manner that makes them accessible to all. 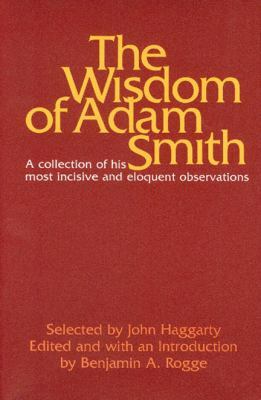 "Smith, Adam is the author of 'Wisdom of Adam Smith', published 1976 under ISBN 9780913966211 and ISBN 0913966215. Loading marketplace prices 6 copies from $0.95 How does the rental process work?